From Spain it was on to Grenoble, France. Beth & family have moved there for work and as long as I’d made the trip this far, might as well pay a visit, right? So from Barcelona it was on to Lyon by plane and then a fast TGV train ride down to Grenoble. 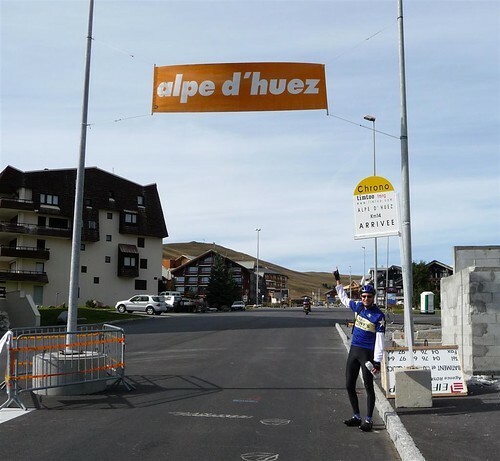 One of the ideas that Kem and I had when we originally planned the trip earlier in the year was the lofty idea that since we’d be in Grenoble and it wasn’t too far away, we too could try our hand at riding up Alpe d’huez. The fabled stage of the Tour de France that climbs at about 8% grade for 14K over 21 switchbacks has become something of a mecca for bicyclists. Something to test your mettle. There’s a great picture of the route up the mountain here. 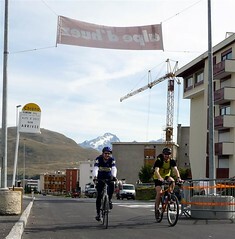 My cold/sniffles had begun to subside enough that the semi-thought out idea of riding up Alpe d’huez during the week I was in Grenoble could perhaps take place. Chris was taking the day off on Wednesday and it would all depend on the weather and how I felt come Wednesday morning. Things aligned well and the opportunity presented itself. The weather was fantastic come Wednesday morning and I was feeling pretty good. Chris was up for giving it a try and now all we needed was to figure out how to get there and get the bikes there. Chris had a bike rack for the top of his car but had yet to set it up so he got busy. Meanwhile, I needed to reassemble my bike. It had been all boxed up for the trip from Barcelona. That took an hour or so. By mid day Chris had gotten the bike rack all assembled and on the car. We were off. Did we really know what we were doing? We had no idea. Chris figured out how to get there and snaked us up the valley to find the base of the mountain. We just parked along the side of the road. We saw a few other cars there and figured it was OK. As it turns out there was another rider just taking off. His wife or girl friend was taking pictures and off he went. We took a few pictures at the base too. Then we headed up. Unless you ride up the valley some beforehand, there’s not really any warm up involved. Rather, you round a bend and there it is, the ascent begins. The road surface is littered with names painted on it. There’s stuff painted from start to finish. No doubt a lot of folks as well as pros do this ride. We knew it’d be chilly at the top so we brought backpacks with extra stuff to wear for the descent later. (We were optimistic we’d make it to the top.) I wore tights and on the way up they probably weren’t necessary. It was a sunny day and while not hot, the exertion alone warmed us to the point where we didn’t need a lot of clothing. It goes without saying that you need to be pretty fit to do the ride up to the top. But you don’t have to be Lance Armstrong to do the ride. That is, as long as you don’t really care how long it takes and you’ve got a decent bike with the right gearing. I geared things such that I was just on the edge of being winded and hunkered down for the climb. We stopped a couple times to gawk at the view and take some pictures – it’s very pretty – and otherwise just crawled up at a steady pace. We were there in something around 1:45 min. Not exactly speedy but then we weren’t racing and by the time we’d warmed up and got into a rhythm, it was just a fun ride. Near the top we encountered a professional photographer that was taking pictures of us tourists making the trek up. He’d hand you a card and if you want you can buy the photos he took. At the top we got another couple riders that were doing the same thing to take our picture. Funny thing was one of them was from Colorado, one from Utah. Like I say, a mecca for cyclists. We didn’t hang around too long. It was in fact chilly up there and we were cooling off fast. We got the extra stuff on from our back packs and headed down. We encountered several more people – several with similar jerseys that appeared to be from Japan – that were making the ascent. The ride down is quite a rush. The grade on the way up is consistent enough that at some point it doesn’t seem that steep. But on the way down, for some reason it seems steeper. Kinda like when you’re skiing and you head down that first run of the day. It seems kinda steep, right? Anyway, you need to be on the brakes a LOT on the way down. Those switchbacks come up fast. There was a lot more traffic on the road than I expected there would be. There’s a lot more populated places on the route and at the top than I would have thought there would be. It’s a pretty big ski resort up there. Anyway, you really need to keep to the right. Going up it wasn’t that much of an issue. Going down it was more interesting ’cause you’re going MUCH faster. So, would I recommend the ride? Absolutely. If you get the chance, take it and make the ascent.